This post is part of a series on my visit to Seoraksan National Park on the fiftth day of my Holiday in Seoul, Korea. If you haven't read the first part, that's here: Korea day 5 part 1 - Route 7 through Sonyang-myeon. 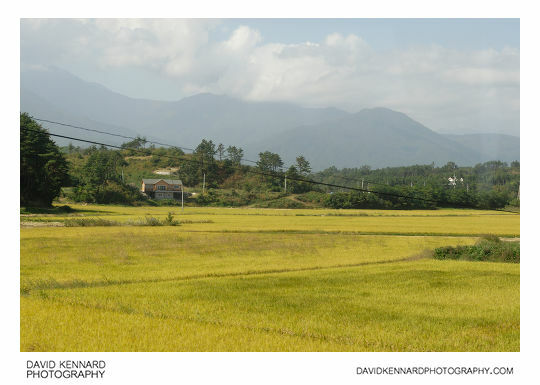 After travelling through a small part of Yangyang, we were back out into the countryside (though still within the area of Yangyang-eup). 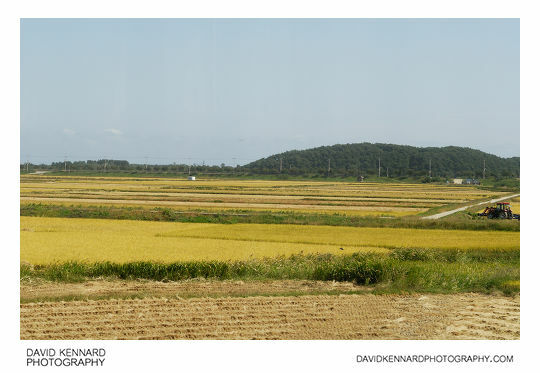 The photo above shows some more rice fields, in Josan-ri (Hangeul: 조산리; Hanja: 造山里). This photo was looking across to the east (towards the sea), rather than the west (towards the Taebaek mountain range), which is why there are no mountains in it. In the photo above, you can see various stone sculptures on a hill (amongst all the wires). I think that possibly this is a buddhist cemetery. Running the text from the sign through Google translate doesn't help much, other than that it might be something to do with a cemetery, or maybe an arboretum. Above, more rice fields. Looking west again, you can see the mountains in the distance. And, of course, more wires in the foreground. 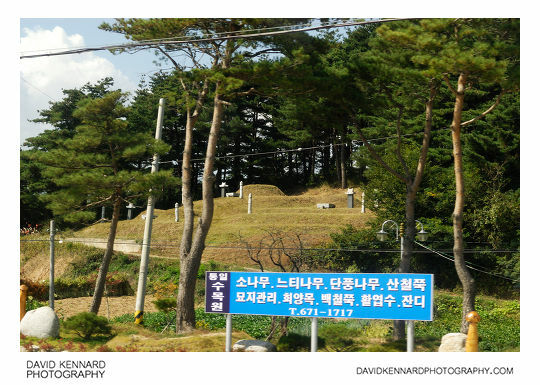 This photo was taken in Powol-ri (Hangeul: 포월리; Hanja: 浦月里), which is still part of Yangyang-eup. A bit further on I managed to grab a shot of this church before it disappeared behind the trees. What I find interesting about this building is the colour scheme - brickwork walls coupled with a blue roof and orange spire. 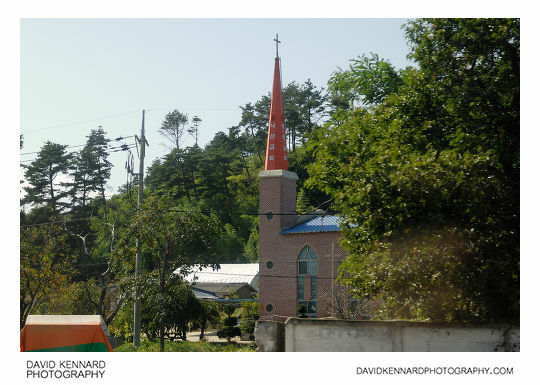 The church is called '낙산교회', which Google translates to 'Confirmed Church', and it is located in Josan-ri (Hangeul: 조산리; Hanja: 造山里).